List at least three books that inspired you to perform any sustainable living act or inspired you to live green, and then tell us why they inspired you. Select at least three other blogs to invite/tag for the project and post a link to them. 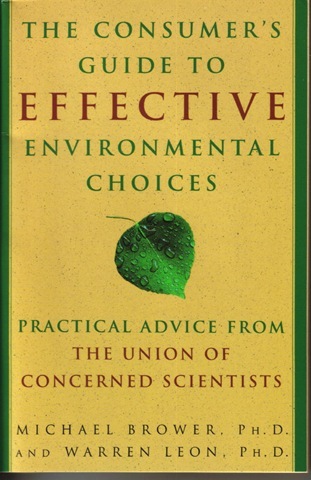 When I first joined the Union of Concerned Scientists more than a decade ago, I received The Consumer’s Guide to Effective Environmental Choices by Michael Brower and Warren Leon (Three Rivers Press, 1999) as a membership gift. The book first presents an analysis of how consumer choices affect the environment and then provides recommendations for action. This book changed the way I thought about my consumption choices, both by reminding me that the best consumption choice was to consume less and also by helping me to think more clearly about purchasing decisions. This guide distinguishes between consumption decisions that have a big impact (where to live, how far to commute to work, transportation choices) and those that are far less important. When I needed to find new rental housing in Gettysburg, this book influenced me to search close to work; after I moved, it helped motivate me to walk to work (even though the distance of a little over a mile is beyond what most Americans consider appropriate for walking); and it also influenced me to buy a hybrid car before it was a trendy choice and when I had to defend my decision to friends and family who insisted that it wasn’t a cost-effective decision. This book also convinced me to stop worrying about using paper towels and paper napkins, but also made me more committed to buying products made of recycled materials whenever possible. Two books by Michael Pollan, The Omnivore’s Dilemma (Penguin Press, 2006) and In Defense of Food (Penguin Press, 2008) have had an enormous influence on the way I think about food and the way I eat. Before I read these books, I was already a member of the Maine Organic Farmers and Gardeners Association (MOFGA), and I tried to follow their recommendation to have at least 10% of my diet be locally grown food. These books, though, gave me a much greater understanding of the food production and distribution systems, an understanding that increased my commitment to eating local, sustainably grown whole foods. These books also introduced me to resources like Localharvest.org, which made it fun to find delicious food from local farmers. I’m pretty sure I had heard of CSAs (Community Supported Agriculture) before I read these books; but after I read them, I joined one. The most recent book to excite me by shaking up my thinking has been Bringing Nature Home by Douglas W. Tallamy (Timber press, 2007). I have recently reviewed this book (here). It is too soon to tell how profoundly it will change the way I garden, but it has already changed some of my plant choices. More importantly, it has changed the way I think about gardening, particularly by making me much more aware of the role of insects in ecosystems. Adrian at Ecological Gardening, whose blog has played such an important part in my own education. Diana at Elephant’s Eye, who so often writes with passion about environmental concerns. Joene at Joene’s Garden, who is such a marvelous source of information about environmental research. Meredith at The Enchanted Earth, who reminds me to pay attention to the earth’s small wonders. Stacy at Microcosm, who has such a talent for linking everyday experience with the big picture. Bel at Green Out Every Window, whose blog title proclaims her commitment to living green . John at Summit Springs Farm blog, who with his wife Sonya provide me with delicious food through their CSA. I thought it would be great to hear what has inspired this new generation of organic farmers. Thanks again to Michelle at The Sage Butterfly for coming up with this wonderful Earth Day idea. Good stuff, Jean! The Pollan books were big for me, too. Great list, Jean. The Polan books are still on my to read list, particularly after reading and watching many of his interviews. I’ll have to add The Consumers Guide to Effective Environmental Choices to my to-read list as this sounds like a good return and return again resource. I totally agree with you on Bringing Nature Home and had this book on my list as well. Thank you for inviting me to join this meme. It was thought provoking, fun, and now I get to enjoy reading recommendations from so many fellow bloggers. John and Joene, Thank you both for joining in. Joene, I think you’ll enjoy the Pollan books. I’ve been a big Pollan fan since I read his first book (about gardening) many years ago, and I consider The Omnivore’s Dilemma his best work. I love In Defense of Food, too, for it’s joyful, upbeat sense of possibilities. What a lovely post! I enjoyed reading about the bloggers and the books that influenced you. The Consumer’s Guide to Effective Environmental Choices is going on my reading list. It sounds like it offers a wealth of valuable information. Your ability to allow yourself to change in ways that reduce your carbon footprint is admirable. Thank you for participating in The Earth Day Reading Project and Happy Earth Day. Michelle, Thank you so much for hosting this Earth Day event; it was inspired! I am so enjoying reading everyone’s recommendations and discovering lots of new books to read. Jean, it’s wonderful that people are being inspired to take action on being green. The best thing my city did was to start composting. Now everything that doesn’t go in my own ‘backyard composter’ (veggie and fruit scraps) goes into my Green Bin (everything else leftover from the kitchen from meat bones to stale bread and many other things that we don’t put in the regular recycle bin (like wax paper and serviettes). We hardly put out anything in out garbage cans anymore. Diane, My town went to much more inclusive recycling a couple of years ago, and it has made a big difference for me. I typically go to the transfer station with two big containers of recyclables and 1 or 2 small trash bags. They do some composting, too, but I don’t think paper products are included. Wax paper in the green bin? Oh well. Only got my post up today Jean. Whew! Made it! Posted my post! I too love the Pollan and Tallamy books. Hadn’t seen the Consumer’s Guide. Thanks for the invite. Diana and Adrian, Thank you so much for joining in. I loved your book choices. Jean, these books are all new to me and all look so interesting. I already purchased Bringing Nature Home after your initial review (although still haven’t gotten around to reading it) but I’m also looking at the Guide to Effective Environmental Choices and thinking that looks really great too. I’m seeing so many great books through this meme, Sage Butterfly did such a great job coming up with this idea. Marguerite, I enjoyed your choices, too. And I agree that Sage Butterfly deserves an award for organizing this. What a great idea! Shyrlene, Thanks so much for the link. Local Harvest has had a huge impact on my eating. That’s how I found the small farm on the outskirts of Gettysburg that raises chickens and goats and makes goat cheese to die for, the Maine turkey farm that provided the amazingly delicious turkey for my Christmas dinner this year, and John and Sonya’s fabulous CSA at Summit Springs Farm, just a few miles from my house. Hello Jean and thanks for sharing your book choices. If I’m honest I”ve only really started to give serious thought to food distribution, or at least my personal choices in relation to it in the last couple of years, but now I consider it carefully. I will have to see if I can track down Pollan’s books! Good list! When I was 16 (back in the 80s) I found a book called “1001 ways to save the environment “- I was a teenager on a mission! I nearly drove myself and everyone around me insane trying to do it all. Older and wiser I still try and still enjoy books like” Animal, Vegetable, Mineral” (BArbara Kingsolver) where I can find practical and realistic ways to save the planet! Heidi, It’s only been a couple of years since I started to think seriously about the food distribution system, but that new awareness has had a big impact on the way I eat (although, in truth, I was never into lots of processed foods). I’m pretty sure that the Pollan books, which have been big international bestsellers, are available in Australia. Byddi, Isn’t “teenager on a mission” redundant? lol. I seriously thought about including Animal, Vegetable, Mineral on my list. I love that book (especially Lily and her chickens). They sound like inspirational books Jean, the consumer’s guide in particular. I used to have a copy of the UK equivalent, but no longer have an up-to-date version. I must look in to that. Janet, The consumer’s guide I included here is now 12 years old and hasn’t been updated. But I think the basic principles are sound enough to weather changes in consumer products and technology. Although I would be interested in hearing their take on consumer electronics (including hybrid cars); I think we turn a blind eye to the kinds of mining and toxics that are involved in the manufacture of these products. Hoping, when you have a chance/time, that you will share Carolyn’s Shade Garden with us? Diana, It’s next on my list — probably in the next couple of days. Great list! The Pollan books had a major influence on me, too. I also liked Tallamy’s Bringing Nature Home. After reading that, I realized how silly it was to remove leaves from the garden and replace them with hardwood mulch. Leaves = natural mulch, natural fertilizer, and bird food (insects). Sheila, I agree about Tallamy; he explains things so clearly and simply that you immediately rethink taken-for-granted practices in your own garden. Noel, You give me too much credit. I have always had good intentions regarding the earth and environmental stewardship, but my actions have sometimes been seriously misguided. Thank goodness for great environmental writers and many of my fellow garden bloggers for helping me to think more clearly about these issues. Jean, I’m now going to have to read Bringing Nature Home, for sure. I so enjoyed your post and your recommendations (and the book review, sounds like this writer is going to be a match for my no-kill way of gardening). I may post my selections this week. (Better late than never, I tell myself.) Like you, I am grateful for those who continue to educate us. I feel our civilization is so complex that even with the best intentions, we need to learn a lot before we can make the choices that will best align us with those intentions. Right now, for instance, my husband is learning about greenwashing, and I’m finding his outrage refreshing, even while I remind him that I’ve been avoiding giving our money to those companies for a while now. Hope you had a joyful Earth Day and Easter! 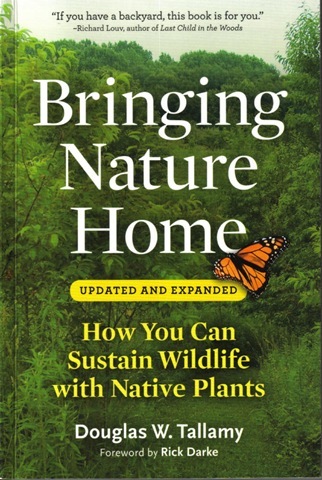 I haven’t read Bringing Nature Home, but I think I’d enjoy it, as that’s much of what we’re hoping to achieve here. Sustaining our native wildlife by providing the very plants they need. The Michael Pollan books though I’m very familiar with. I almost feel sometimes that they should be required reading. It’s difficult to read them and remain ignorant as to how food is produced in 21st Century America. I’m going to have to look up the Consumer’s Guide, I haven’t read that yet. Meredith and Clare, I think you would both enjoy Bringing Nature Home. Meredith, I’d love to see your own reading recommendations when you get a chance to post them. (Since Carol has suggested that we should have Earth Day once a week instead of once a year, that gives you lots of options for timing. :-)) I’ve always loved walking, so walking to work is a natural for me (brings back memories of walking to school as a child). I don’t love it every single day — sometimes when I’m very tired at the end of a long week or on a cold day when I’m walking home into a biting northwest wind, I can find myself whimpering a bit during a fairly steep uphill part. But at this time of year, the walk is nothing short of glorious. Clare, I know what you mean about Pollan’s books; I find all of them (but especially these two) very compelling. A colleague of mine who teaches a sociology of science course, does require students to read Pollan. Thanks for the list, I’ll definitely look into them. I too drive a hybrid, and for years didn’t even own a car(!! ), and I don’t care what they say, I love it. It gets close to 50 mpg, it can haul a wingback chair, and it makes me feel like I am putting something in life above cost effective. I wonder if people realize what they are saying when they make statements like, ‘its not cost effective,’ in reference to items that clearly have other benefits.